Black Kat | way above the level. King Addies himself just put up the Audio for last weeks Global Cup Clash on DHR. Hopefully this is the full Audio of the night, after all that raetaetae that was going down latlely on DHR. Nevertheless, the Promoter of the King Addies vs. Supersonic Clash in Antigua could never thank them peeps over on DHR enough for all those drama about the outcome of Global Clash. Best Promo him coulda wish for. I personally think it’s the best that could happen to Soundclash right now. We need this animosity to spice it up a little. and Supersonic took the Global Clash Title in NYC. Respect to both of them! From what i’ve read the clash in Wuppertal was a bit boring and nothing special, but we have to decide when the Audio’s dropping. Curious if Foundation is on a killing spree now and take also the clash in Gütersloh tonight against Trinity Sound. 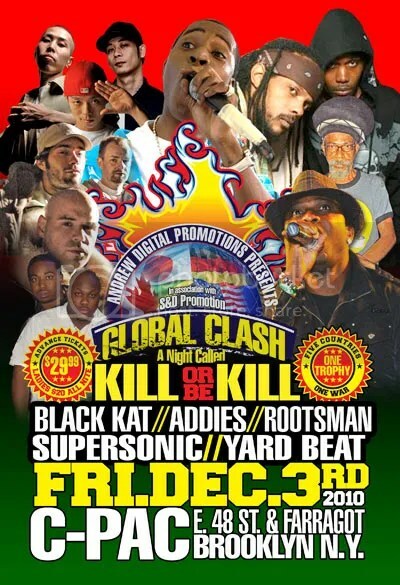 For the Global Clash, Rootsman dropped out first, then Yardbeat and finally Black Kat. Sonic and Addies played Dub fi Dub. Seems like the next weekend has a lot of bloodsplashing goin‘ on that you guys need to know about. First you have, on Friday, the 3rd of December, the annual Global Clash, in Brooklyn, New York. 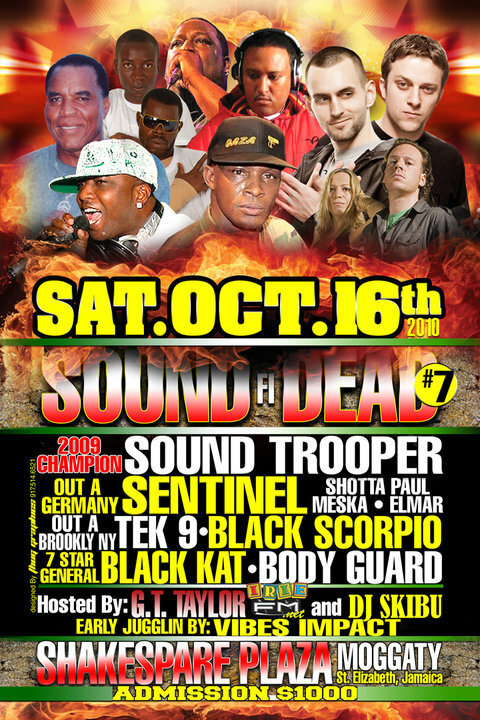 Black Kat, Supersonic, King Addies, Rootsman and Yardbeat ago war it out at C-Pac. 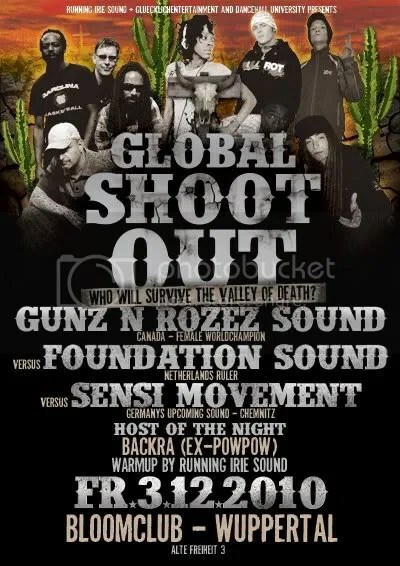 Across the pond, at the Bloomclub in Wuppertal Germany, there’s the Global Shoot Out Clash with Sensi Movement from Chemnitz, Germany clashing against Gunz’n’Rozez from Ontario, Canada and Foundation Sound from the Netherlands on Friday. 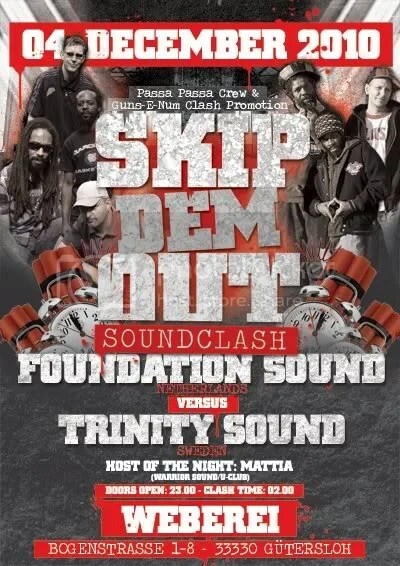 Then, on Saturday, the 4th of December, Foundation Sound clashes again, against Trinity Sound from Stockholm, Sweden at the Weberei in Gütersloh, Germany. Finally a likkle supp’n out of the bush of St.Elizabeth. 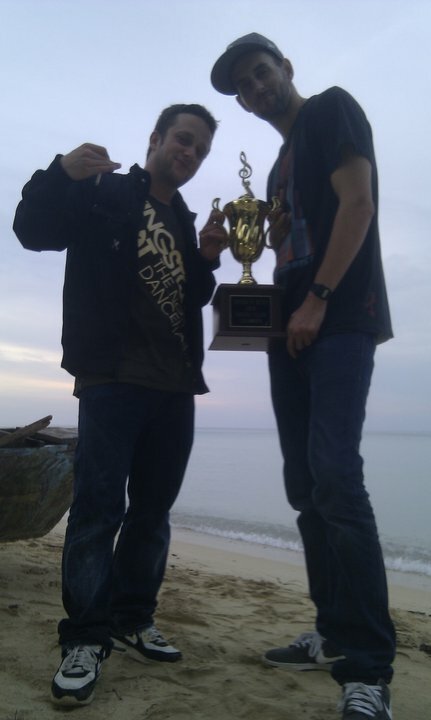 Listen how the Sentinel Young Guns got the Sound Fi Dead Trophy. Pity Body Guard, Black Kat and Trooper run from Clash…. *gonna keep you updated with the DVD.